Do you ever wonder if it's appropriate to give a client or someone at the office a gift, and if so, what should you give? There are some things you need to consider before you make your decision, including your company's policy on this. Whether this is a professional thank you gift to a client or a group gift to the boss, it's essential to maintain business etiquette at all times. 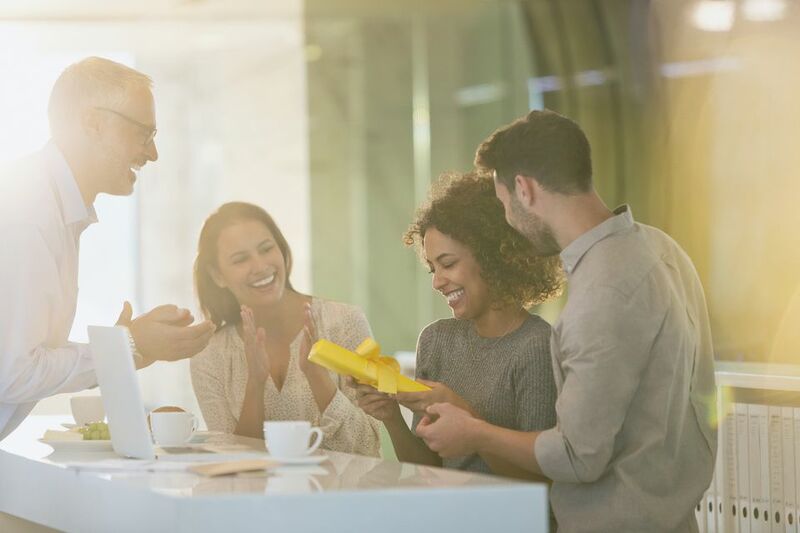 Whether you want to celebrate a birthday or show your generosity during the holidays, giving gifts to business connections can be very sensitive, so it is imperative to follow proper etiquette. You need to make sure the gift is appropriate and follow the customs and norms of your industry. They're there for a reason. You should never expect a gift in return. In some countries business gifts are inappropriate, regardless of the reason. In other countries, there are certain ways a gift must be wrapped. If you are unsure of what is acceptable, do some research on the culture to find out. The best intentions can backfire if you don't, and it can take you to an awkward place with that person in the future. Gifts chosen for a business associate or client should be creative and relevant to the occasion. However, always avoid anything too personal that may be misinterpreted as a bribe or something that may be insulting or embarrass the recipient. Don’t give a business associate intimate apparel, expensive perfume, or jewelry that is not related to the business. Gift giving and celebrating in the office can be done in a variety of ways. You and your colleagues might prefer taking up a collection to purchase one nice gift rather than each coworker giving something small. If you choose the collection method, offer a suggested range and be sensitive to those who are unable to give. Those who want to give something more personal should have the option to give a token amount to the collection and give their own gift in a more private setting. When celebrating, remember that this is an office. Be aware of time, appropriate behavior, and the needs of the business. Most of the time, you’ll want the person to open the gift in front of the team. Showers of any sort should be held during breaks or lunch hours. Participation should not be required of everyone, but if the shower is held on the premises, everyone on the guest of honor’s team should be invited. If you want to leave anyone out, conduct the shower elsewhere. In most business settings, managers will only give gifts to those who work directly under them. If the department is large, with a dozen or more people, managers should not be expected to foot the bill for gifts for each person. However, it is acceptable for a manager to have a small gathering with direct reports, and it is fine for him or her to give small, appropriate gifts. Most of the time, employees are not expected to give gifts to their managers. However, small, inexpensive items are suitable, as long as they are in good taste. Picture frames, coffee mugs, and books about topics of interest are ideal gifts for bosses. An expensive gift is never appropriate for an individual employee to give to a supervisor. If someone unknowingly chooses to give something that exceeds the normal range, such as a set of luggage or expensive bottle of wine, it is up to the supervisor to graciously decline and say, “I appreciate the thought behind such a nice gift, but I can’t accept anything so expensive.” If the people in your office would like to take up a collection for a larger gift from the team, that is fine as long as it meets the appropriateness test mentioned earlier. Avoid giving anything that will put the supervisor in a bad or uncomfortable position. It may upset him or her, and that can create awkwardness or dissension in the future. Always acknowledge any gift you receive as soon as possible. Handwriting a thank you note is always more desirable than an email or text message. If you are the recipient of a large quantity of gifts, don’t take company time to write the thank you notes. Do that after hours. Don’t rely on your memory. As you open each gift, jot down the giver’s name and a short description of the item. The thank you note may be brief, but include something unique in each one, such as, “Thank you for the coffee mug. I’m sure you’ll see me using it every morning at the office,” or, “I appreciate the gift card to my favorite restaurant. They have the best fish platter in town.” You may hand deliver the notes or send them in the mail.